The Powerline 45 Degree Back Hyperextension PHYP200X is a combination inverted back extension and oblique flexor, set at an exact 45° angle for ultimate conditioning. Strengthen your lower back safely and comfortably on the strongest 45° Hyper available. This combination Inverted Back Extension and Oblique Flexor is set to an exact 45° angle for optimum conditioning. Telescoping midsection pads adjust to all size users and feature thick, double stitched pads for comfort and support. Over-sized 8" foam rollers hold you securely in place. Fully adjustable 4" thick midsection pads provide maximum comfort for all size users. Powerline 45 Degree Back Hyperextension PHYP200X by Body Solid is a powerhouse combo inverted back extension and oblique flexor. The Powerline 45 Degree Back Hyperextension PHYP200X is the most comfortable and safest 45 degree hyperextension bench available in the market today. As the name says, it is set a precise 45 degree angle, a recommended position for ideal conditioning. The Powerline 45 Degree Back Hyperextension PHYP200X by Body Solid features telescoping 4" midsection pads that can be conveniently customized for users of all sizes. The Powerline 45 Degree Back Hyperextension PHYP200X will also keep you in maximum comfort and support during your exercises with its double stitched pads and generously oversized 8" foam rollers that also keep you securely in place for your own safety. Exercises using the Powerline 45 Degree Back Hyperextension PHYP200X by Body Solid can decrease lower back pain significantly by fighting compression fatigue. in addition, you can experience a welcome increase in flexibility and even circulation as you simultaneously strengthen your abdominal and back muscles. Call 1-800-875-9145 to chat with one of our fitness agents with any questions you may have about the Powerline 45 Degree Back Hyperextension PHYP200X. Order your Powerline 45 Degree Back Hyperextension PHYP200X from FitnessZone.com today! 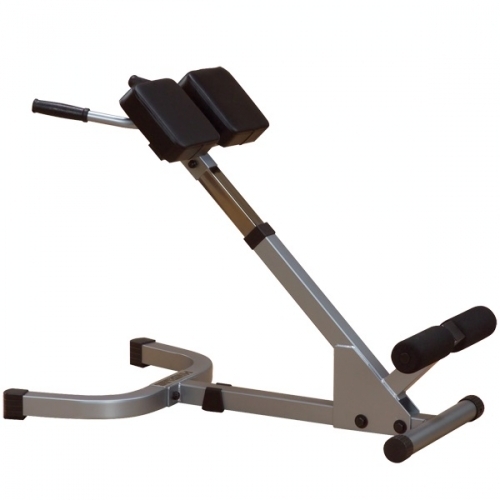 Order your Powerline 45 Degree Back Hyperextension PHYP200X from FitnessZone.com today!